How to get more description of the geodata ? In part I we've configured internal definition of styles, each called a NamedStyle, and this is by using SE 1.1 because deegree3 is based on it internally. But what if you are interesting as a client to get a map from a WMS with your custom style because there are interesting underlying data you want to visualize? The interesting is that when a WMS service is combined with the SLD profile, then it comes with the UserStyle mechanism to allow external client to portray internal geodata in a custom way. Now the situation is you as a client which means you have no more access to the WMS console (as we had in part I). How can you get more information on what geodata the WMS service (you know available at http://localhost:8080/services/mywms) is able to offer ? To invoke it, we need to submit a POST HTTP request. By hand we use the REST Client firefox extension. All these internaly-defined NamedStyle that the WMS service offers are nice, but as an external client (versus the WMS manager), I would like to represent these lakes with my own style (without asking the WMS manager to add it as an internal NamedStyle). Indeed, until now, when requesting a WMS GetMap, we were able to link a NamedLayer only with a NamedStyle through the usual LAYERS and STYLES parameters. To link with a custom style, we need to create a sld:UserStyle ! A sld:UserStyle is a standardized way to link a server-side layer (e.g. NamedLayer) with a client-side custom style defined with SE language. This WMS capability is enabled thanks to its SLD profile. Now that we know everything about the “meteocities” layer, we are be able to create a custom style so as to transform the precious meteo properties into meteo symbols and labels. 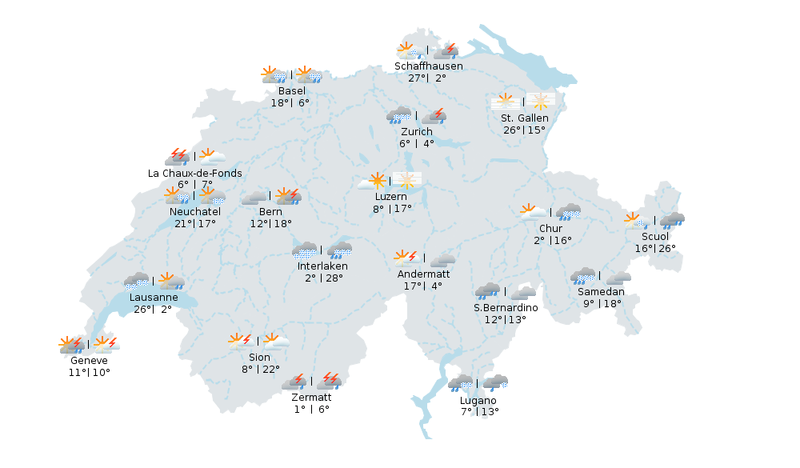 Have a look to the meteosuisse map and you will notice there is no meteo information for Rapperswil. So we will have to ignore that specific feature before starting our meteo style. A rich style of rules to define weather symbologies. These symbologies are applied to all cities except Rapperswil because of a LayerFeatureConstraints. LayerFeatureConstraints configures the step of selection of the features to give to the rendering engine.